MetroPCS Archives · Stop the Cap! 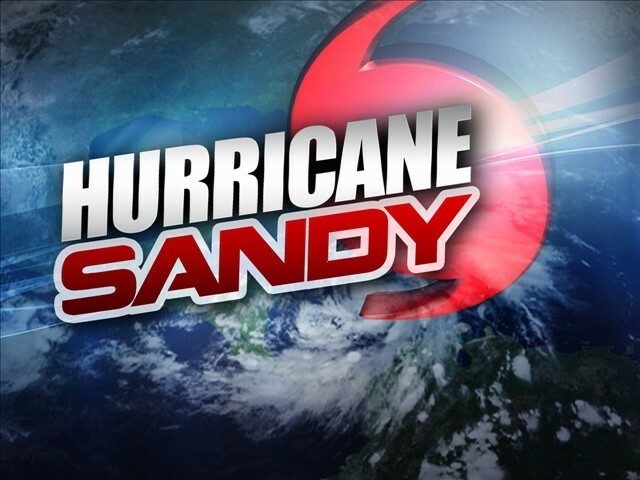 Hurricane Sandy’s destructive forces of wind and water, combined with extensive electrical outages has wreaked havoc with telecommunications services from Maine to Virginia, leaving some customers potentially without service for weeks. The storm has flooded Verizon‘s central switching offices in New York City, did extensive damage to Sprint’s wireless network and infrastructure, has left large sections of upstate and downstate New York without cable service, and clocks ticking for wireless cell customers using cell sites currently running on battery backup power. Some of the worst problems are affecting Verizon’s landline and FiOS networks after the company lost two critical switching centers in Manhattan to extensive flooding. That has contributed to significant problems for Verizon customers across Manhattan, Queens, and Long Island. Further afield, Verizon customers without service can blame power outages and fallen trees that took out overhead wiring. Together, Verizon customers are experiencing significant problems with landline, broadband, and FiOS TV and Internet services in some areas. Many Verizon Wireless cell sites are operating on battery backup units which maintain service for only a limited time. New York, New Jersey and Connecticut customers report increasing difficulty maintaining cell service signals as those battery backup units start to fail. Verizon engineering crews can restore undamaged cell sites with backup generators once permitted into storm-ravaged areas. Cablevision‘s business largely depends on areas that took a direct hit from Hurricane Sandy. Cablevision repair crews are encountering extensive power outages and damaged overhead wiring brought down during the storm in Connecticut and Long Island. Its service area closer to New York City has been primarily affected by power outages. Comcast said it was still starting an assessment process and was not prepared to report on the current state of its network, which operates in cities north and south of the New York City metro area. While Time Warner Cable spokesman Alex Dudley reports little damage to Time Warner Cable’s systems, many remain offline from power interruptions, and Time Warner’s Twitter feed for upstate New York reports isolated outages in Portland, Maine and across upstate New York, primarily due to power losses or damage to infrastructure. Sprint appears to be the hardest hit wireless carrier with widespread service outages, interruptions and call completion issues throughout the states of New York, New Jersey, Connecticut, Pennsylvania, Washington DC, Maryland, North Virginia and New England. Some customers far away from the worst-hit areas report trouble making and receiving calls on Sprint’s network. Many cell sites are also damaged. AT&T is assessing damage to its landline operations in Connecticut, where it is the dominant phone company. Many AT&T cell phone sites, like Verizon, are operating on battery backup in power outage areas until AT&T can bring generators online to maintain service. T-Mobile and MetroPCS report damage and service outages to their cellular networks as well, mostly from power outages. Outside of WOR (710), most New York City area AM stations are off the air. WOR survived the storm with its recently built three tower site located just above the flood waters. Chief engineer Tom Ray told NERW the water is 10 feet deep at WOR’s transmitter site in the Meadowlands. Many AM stations in New York favor transmitter locations in now-ravaged Lyndhurst and the Meadowlands. The result: indefinite absence of all-news WINS (1010) (it’s now back up — thanks to an update from Scott Fybush), which is now being heard on WXRK (92.3). Also missing: WLIB (1190), WSNR (620), WMCA (570), WNYC (820), WPAT (930), WNYM (970), WADO (1280) and WWRV (1330). FM outlets favor much higher transmitter locations, usually atop large skyscrapers, that escaped flood damage. The Jersey shore’s FM outlets are mostly silent. Atlantic City was among the hardest hit, and some stations may be off the air for some time while rebuilding. Connecticut stations are also off the air. Powerhouse WICC (600) in Bridgeport has transmitters on Long Island Sound — a poor choice to withstand Sandy. It is likely underwater. Also gone: WGCH (1490 Greenwich), WAXB (850 Ridgefield) and WSHU (1260 Westport) and WALK-FM (97.5 Patchogue). Repair crews for all concerned will likely only start assessing damage later today, but many will have to wait for power crews to complete work — they have first priority. Those lucky enough to see service restoration once power returns will be in far better shape than others who could wait weeks to get their Internet, television and phone service back. Correction: Original story included reference to studio power knocked out at WOR-TV. That should have said WOR-AM (radio). The parent company of T-Mobile USA has agreed to buy MetroPCS in a reverse stock split that leaves parent Deutsche Telekom able to eventually spin off the combined entity as an independent company and exit the U.S. market. The merger will bolster T-Mobile’s mobile spectrum in several large cities, with up to 20MHz available for a robust LTE 4G network, better positioning the company to compete with third-place Sprint. T-Mobile plans to decommission the smaller carrier’s CDMA network by 2015, gradually shifting MetroPCS users to T-Mobile’s HSPA+ and LTE networks as customers purchase new equipment. 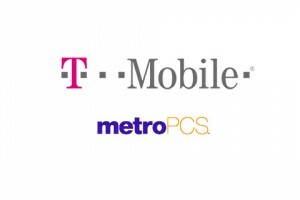 MetroPCS customers will find T-Mobile phones for sale immediately after the deal closes. Legere says any customers still using MetroPCS’ network during the last 8-12 months before the network is decommissioned will be offered a strong incentive, such as a deeply discounted phone, to move. Legere adds the deal will cement T-Mobile’s position as America’s only nationwide carrier offering truly unlimited 4G HSPA+/LTE wireless data service. Sprint’s network still largely depends on 3G and an older, slower standard called WiMAX. Legere says T-Mobile will now become the nation’s largest no-contract phone carrier, and will emphasize it welcomes customers who bring their own phones to the carrier. Legere adds T-Mobile’s new 4G network will be able to rival the quality of its larger competitors when it is fully deployed. But the merger also may trigger an even larger wave of wireless consolidation in the industry, as remaining players jockey for position in response to today’s announcement. Both Sprint and Leap Wireless, which owns Cricket, are under increasing pressure from investors to respond. Leap Wireless could soon face a takeover bid itself, either from T-Mobile USA or Sprint. Some investors are even calling for Sprint and T-Mobile to merge, becoming a more effective competitor for Verizon and AT&T. The proposed merger still needs approval from the Federal Communications Commission. Regulators are not likely to oppose deals with either MetroPCS or Leap Wireless, as both smaller carriers operate networks that largely do not overlap and both hold only a minuscule market share. German investors wary about T-Mobile’s new emphasis on prepaid service, considered a negative in Europe, were reassured by Legere that Americans pay higher prices for prepaid, no contract service than what is prevalent in Europe. The combined T-Mobile/MetroPCS remains the fourth place carrier with 42.5 million customers. Sprint has 56.4 million customers. Deutsche Telekom AG, parent company of T-Mobile USA today confirmed it was in talks with MetroPCS Communications, Inc., to merge their two wireless businesses to achieve the greater scale both need to compete with Verizon Wireless and AT&T. Bloomberg News reports DT’s supervisory board will meet tomorrow to approve the transaction. The sixth largest wireless company in the U.S. is about to merge with the fourth largest, according to news reports. The combination would inject an additional 9.3 million current MetroPCS customers (the sixth largest wireless carrier) into the T-Mobile USA family. That would more than make up the 2.76 million former T-Mobile contract customers that fled the carrier during the last two years, especially after learning the company was planning to merge with AT&T. MetroPCS operates a CDMA network incompatible with T-Mobile’s GSM network. Both carriers are moving towards adopting 4G LTE service, but legacy customers will not be able to use existing phones on each other’s networks. MetroPCS currently offers home coverage in 19 metropolitan markets and surrounding areas including New York City/Northern New Jersey, Atlanta, Bakersfield, Boston, Dallas, Detroit, Jacksonville, Las Vegas, Los Angeles, Miami, Orlando, Philadelphia, Providence, Riverside, Sacramento, San Francisco, San Bernardino, San Jose, Shreveport, and Tampa. T-Mobile is proving once again that as an independent cell phone provider, it is prepared to be a scrappy competitor for your wireless dollar. America’s fourth largest cell phone company today announced it was getting into an emerging “unlimited data” war with its larger competitor Sprint and smaller contender MetroPCS, announcing it will bring back a truly unlimited data plan for its customers. Starting Sept. 5, T-Mobile’s Unlimited Nationwide 4G Data plan will be available for $20 per month when added to a Value voice and text plan or $30 per month when added to a Classic voice and text plan. For example, a single line Value plan with unlimited talk and text combined with unlimited nationwide 4G data will cost $69.99 or a single line Classic plan with unlimited talk, unlimited text and unlimited nationwide 4G data will cost $89.99. The plan cannot be combined with Smartphone Mobile Hotspot/tethering. Customers who want to share their phone’s data service with other devices will have to choose between a 5GB or 10GB add-on option instead. TmoNews obtained this screen shot courtesy of an anonymous employee at T-Mobile USA. T-Mobile doesn’t consider Sprint’s “truly unlimited” plan in the same class, because it currently operates on a much slower “4G” standard called WiMAX, which Sprint is moving rapidly away from. Many T-Mobile customers use the company’s 4G-like HSPA+ network for data, which offers respectable speeds if your phone supports the standard (the Apple iPhone, for example, does not.) 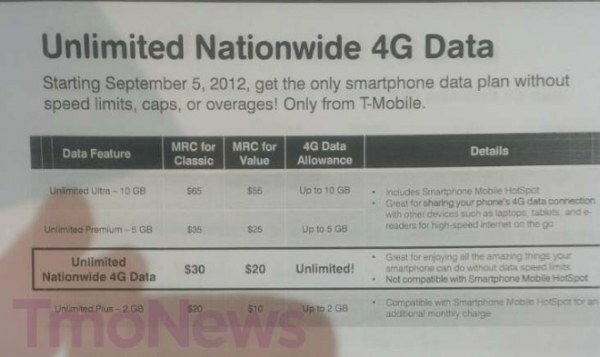 T-Mobile is moving forward on its own upgrade to 4G LTE starting in 2013. T-Mobile’s announcement comes one day after MetroPCS, a regional carrier, announced its own limited-time promotion offering unlimited talk, text, and data for $55 a month (up to three additional lines can be added for $50 a month each). Once a customer signs up for the unlimited service promotion, they can keep it as long as they remain a customer. The two attention to unlimited data plans from the three carriers are in marked contrast to AT&T and Verizon Wireless, which have both moved to curb unlimited use plans — switching customers to usage allowances and overlimit fees. Both companies, considerably larger than any of their competitors, claim unlimited data is impossible to offer because of wireless spectrum shortages and the expense of continually upgrading networks to meet demand. But this does not seem to pose any problem for Sprint, T-Mobile, or MetroPCS. Wall Street believes the new interest in unlimited data is a marketing move to differentiate the smaller companies from the two dominant providers. Wells Fargo analyst Jennifer Fritzsche wrote in a research note to her investor clients that T-Mobile is strategically re-positioning itself in the market to attract new customers. 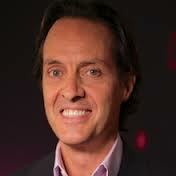 “We believe T-Mobile felt the need to make some change in order to attract attention,” wrote Fritzsche. Other analysts believe T-Mobile needed a “game-changing” marketing move to help it recover from its ongoing losses of contract customers. The company has been losing just over 500,000 “branded” contract customers every quarter for the last year. The pricing and service changes may require Sprint to revisit its current rates. Sprint’s $109.99 Simply Everything plan offers unlimited data, text, and voice — and runs $20 higher per month than T-Mobile’s forthcoming offer, $55 more than MetroPCS.